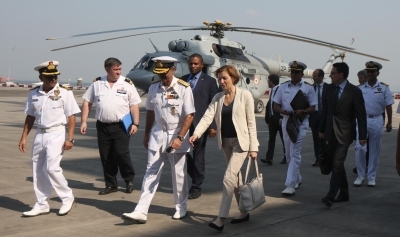 Mumbai, Oct 28 (IANS) France’s Defence Minister Florence Parly on Saturday led a 13-member high-powered delegation to the Western Naval Command and Mazagon Docks Ltd here, officials said. 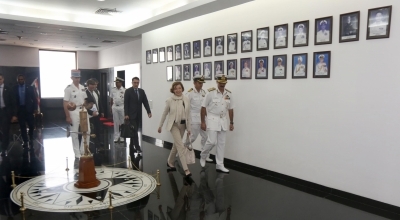 She interacted with Vice-Admiral Girish Luthra, the Flag Officer Commanding-in-Chief, WNC and discussed aspects related to maritime security cooperation, bilateral exercises, ship visits, training, equipment, technology and professional exchanges. Relations between India and France are being accorded top priority by both countries as seen by recent high-level interactions between the nations, with the upcoming visit of French President Emmanuel Macron in the second week of December. Interaction between the Indian Navy and French Navy has nurtured into a strong partnership based on mutual interests over the years. The naval cooperation between the two has progressed most encouragingly in recent years and the increasing scale of operational interactions is an indicative of the growth of understanding between the two maritime forces. Parly on Friday had laid the foundation stone for the Dassault Reliance Aerospace Limited’s Rs 6,500 crore facility coming up at the Dhirubhai Ambani Aerospace Park in Nagpur. Expected to start production from the first quarter of 2018, the DRAL project marks the largest foreign direct investment in the Indian defence sector acquired by the Anil Ambani-led Reliance Group. She also met Defence Minister Nirmala Sitharaman in New Delhi and discussed ways and means to boost defence ties between the two nations.